Pope Francis is approaching 100 days as our Holy Father. The beginning of his papal service has drawn massive attention and offered new ways of carrying out the leadership of the Universal Church. There is amazing interest in this unpredictable story. Washington was both fascinated and appalled by a quick election with no visible campaign, no declared candidates, no consultants or commercials, and the only exit polls were black or white smoke from a chimney. As part of a panel on the new pope at Harvard (not the typical Harvard forum), I asked how a publisher would respond to this novel. Chapter One is about the first papal resignation in 600 years. Chapter Two focuses on a 76-year-old Jesuit priest riding the bus to work as Archbishop of in Buenos Aries. Chapter Three is the story of the conclave, where the Jesuit is elected and calls himself Francis to show commitment to the poor, peace and creation. Chapter Four covers the early days of the new pope as he asks the crowd to bless him before he blesses them, refuses to move into the Apostolic Palace and spends Holy Thursday in jail washing the feet of young prisoners, including women and Muslims. The response probably would have been “don’t waste your time or mine on such fantasy,” but all this actually happened. Like others, I’ve been watching this story in amazement. More importantly, I have been reading and listening. I find Pope Francis’ morning homilies on the scriptures a daily source of spiritual challenge and enrichment, both provocative and hopeful. After 100 days, Washington often asks how the office has changed the new occupant of that office, whether the new leader has been able to make any real difference and what this beginning suggests for the future. Here are some thoughts on those questions. 1. Francis is changing the Vatican, not the other way around. So far, Francis is changing how the responsibilities of the pope are carried out, more than those responsibilities are changing him. He resists isolation and insists on reaching out to a new council of eight cardinals, to those who share the guest house and its common meals, to phone old friends and to reach out to the people he serves, especially the poor and vulnerable. Pope Francis is adapting the customs of the papacy to his pastoral manner, rather than the other way around. 2. Everybody’s pope...so far: Pope Francis is making a big difference in how the papacy and church are perceived. On June 14, Real Clear Religion, a Web site that links to major articles and analysis on religion led with Pope Francis Is Good for Jews, by Francis Rocca, in the Wall Street Journal and Pope Francis Is Good for Protestants, by Chris Nye, in Relevant Magazine. This follows by a few days He's Our Francis, Too, by Timothy George, in the major evangelical publication Christianity Today. This is not the typical coverage of the church and papacy in recent years. By who he is, how he acts and what he says, Pope Francis is helping people, Catholics and others, see our church and papal leadership in very different and more positive ways. In fact, I’ve heard people say they are returning to church because they feel welcomed and encouraged by Pope Francis. 3. Symbolism is substance: Pope Francis is a man of simple ways and powerful words. Symbols are substance in a sacramental church. Where he lives, what he wears, where he stands, how he speaks, how he reaches out to others demonstrate his humble approach to serving as Bishop of Rome. The stories are many: offering a chair and sandwich to a Swiss guard; stopping off to pay his bill and pick up his bag at his hotel; calling to cancel his hometown newspaper; telling Argentines to not come to Rome for his installation but instead to give the money to the poor; and most powerfully, washing the feet of the young prisoners on Holy Thursday. 4. Power is service: From his first homily Pope Francis has insisted “authentic power is service” and that it his responsibility to “open his arms to protect all of God’s people and embrace with tender affection the whole of humanity, especially the poorest, the weakest, the least important.” There is no entourage, no palace guard and no apparent grand communications strategy, just a global pastor on a new stage sharing his faith, hope and love. 5. What’s in a name? In his addresses, homilies and other initiatives, Francis has consistently placed the poor at the very center of his service and Catholic life. Francis constantly lifts up the humanity of those who are poor, our duty to defend their lives and dignity and the church’s obligation to go to the edges of life to be with and care for “the poorest, the weakest, and the least important.” This is a demonstration of Catholic teaching, not a diversion. Francis’ emphasis on the priority for the poor is a bold expression of Pope Benedict’s neglected teaching in Deus Caritas Est and Caritas in Veritate. His strong words about “savage capitalism” and indifference to the poor are applications of traditional Catholic teaching delivered with the passion of a pastor whose heart is with the poor and whose feet have walked the slums. 6. Simple words carry a powerful message: The Holy Father is a reporter’s dream with punchy, provocative, challenging sound bites that communicate moral principle and genuine passion. And the media is having as ball with the comment about “even atheists” being redeemed by Christ. 7. Francis doesn’t fit: Pope Francis defies conventional political, ideological and ecclesial categories. He is not chaplain to particular factions, but a universal leader challenging all of us to set aside our ideological prejudices and political preferences to look anew at our challenges through the lens of the Gospel and Catholic teaching. As I have already written in America, Cardinal Bergoglio challenged the Marxist temptations of some elements of liberation theology, so Francis is more than comfortable challenging elements of “savage capitalism” that leave too many behind. The pope deplores a relativism that empties faith of meaning and goes along with a society losing its moral foundations. He also rejects a fundamentalism that doesn’t “want to change” and those who “wish to turn the clock back” and stubbornly seek to “tame the Holy Spirit.” Francis takes on the secularism that suggests we can build the good society without God and the materialism that says we measure society by what we have or produce instead of how we care for one another, especially the poor and vulnerable. 8. Identity matters: The church is not another organization that does good things, but the body of Christ. “We can build many things, but if we do not confess Jesus Christ, nothing will avail. We will become a compassionate NGO, but not the Church.” He constantly points to Christ crucified and the Resurrection as the center of Christian service and witness. 15. Ideologues need not apply: One predictable development in these first 100 days is the temptation to claim the pope is our kind of Catholic…social activist or evangelical Catholic, culture warrior or dialogue advocate, reformer or enforcer. When I was growing up the key question was whether we agreed with the pope, instead of whether the pope agreed with me. Some are trying to explain away Francis’ passionate identification with the poor and his blunt condemnations of a global economy that leaves too many behind. Others say all that social justice stuff is nice, but is he going to change teaching on abortion and gay marriage? Francis is not a chaplain to any faction, not a cheerleader for any political agenda. In fact, he has no time for ideologues who “falsify the Gospel…end up being intellectuals without talent, ethicists without goodness. And let’s not even speak of beauty, because they understand nothing of that.” He warns against those who resist Vatican II, “don’t want to change” and “wish to turn the clock back.” He likewise warns against those who empty our faith of substance, substituting a “cosmic bath” for prayer, “god-spray” for a real encounter with Christ and water down the faith to seek acceptance. 16. Go to the edges: The dominant theme of these first 100 days is that a church turned in on itself is sick. According to Pope Francis, “A church that doesn’t get out, sooner or later, gets sick from being locked up…. It’s also true that getting out in the street runs the risk of an accident, but frankly I prefer a church that has accidents a thousand times to a church that gets sick.” Francis is calling the church to get out of itself, take risks to proclaim the Gospel and defend the poor and vulnerable. Accidents are tolerable; “self referential” attitudes and behaviors are not. Collaboration over isolation: Pope Francis resists isolation and seeks consultation and collaboration. He has already selecting his own “gang of eight” cardinals to help him lead the church, advising on reform and how to move the church forward. Their first meeting in October should be both groundbreaking and consequential. Personnel is policy: If symbols are substance, than who he chooses to lead key Vatican offices is decisive in setting directions, priorities and tone for the church’s future. Francis has yet to begin to name those who will serve in these key roles. Many are focused on who will be named Secretary of State. However, the most important choices are those who become bishops and lead the church around the world. There are a number of major U.S. dioceses that will have new leadership soon. Who are the “Francis Bishops” who will lead us into the future? The Sisters matter: In the United States and beyond, a key test of papal leadership will be how Francis deals with the visitation of religious communities and the future of the Leadership Conference of Women Religious. Whatever their intentions, these Roman initiatives have seemed to attack the fidelity, work and membership of religious communities that have played important roles in the lives of many Catholics. In a battle between the religious and Rome, the sisters and the bishops, most lay Catholics come down with “the sisters.” The signs so far are mixed with one dicastry reporting papal approval and another official expressing both regret and lack of consultation. In a reported meeting with Latin American religious, Francis seemed to downplay the significance of the Roman actions and urged a renewed focus on mission. This matter cannot be ignored since it has taken on symbolic meaning for many on how the church respects and treats all women. Reform: who serves whom? By all accounts, the new pope has a mandate for substantial reform of the Roman Curia. The fundamental question is: Who does the Holy Father look to to actually lead the church forward: the bishops in local dioceses and national and regional conferences, or the heads of ecclesial structures in Rome? Many insist Roman structures have too often acted as headquarters looking down upon and ordering around the branch managers in the field. These critics suggest this centralization led to monumental lack of coordination among Vatican structures, lack of consultation on appointing bishops, surprise investigations and other processes with unanticipated challenges. They suggest the synods and other consultative structures became frustrating forums for endless five-minute speeches with little genuine listening and discussion on key issues of like clerical sexual abuse, religious freedom, secularization, global conflict and poverty. A crucial decision is whether Vatican structures are to serve the Universal Church in all its diversity and unity or whether local churches are in service of or responsible to the various Vatican structures. Pope Benedict by the end of his service was perceived as a pope who teaches. 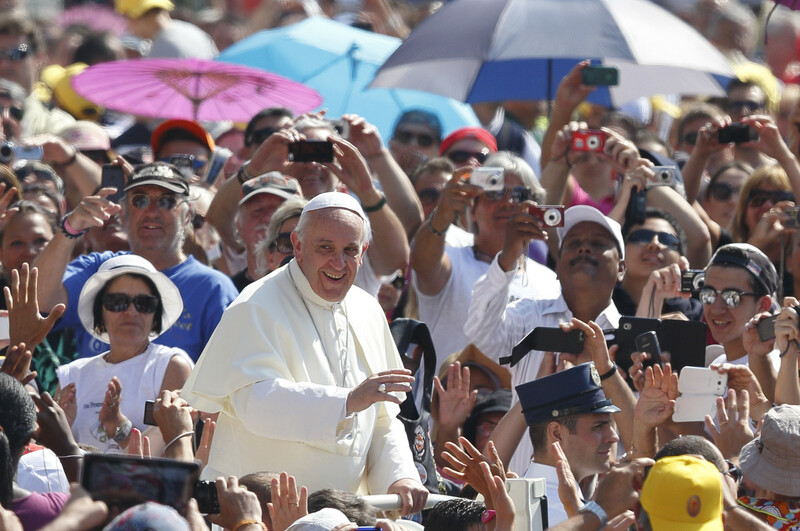 Pope Francis in the beginning comes across as a pastor who preaches—by word and example. This is an oversimplification. Our church has been blessed by remarkable leadership in proclaiming the Gospel and building up the Body of Christ. John XXIII, Paul VI, John Paul II and Benedict XVI have used their enormous gifts and personal courage and fidelity to teach, lead, inspire and serve in differing times and differing ways. This essay is not a statement on authority or ability, but a description of how our new Holy Father is leading the church in these challenging times. Francis is reaching out to those he serves, defending the poor, proclaiming the Gospel with clarity and confidence, applying it to our everyday challenges and warning us against our selfishness and sinfulness. In one telling example, Francis condemned those who see the sacraments as a reward for good behavior, not a channel of God’s grace, insisting that those who come for baptism and marriage should be welcomed, not judged. This is a pope who comes across as very much a “holy father,” a very smart, caring and simple pastor of a global parish who teaches us every day by what he says and does. He is challenging all of us to live out the “good news” of Jesus Christ with courage, joy and humility. One non-Catholic friend watching these first 100 days, said “you have a pope who knows how to pope.” After 100 days, I can’t wait to see how the rest of this story turns out. This article of the "100 Days of Francis" gives me hope for the future of the Catholic Church. It is exciting to read how a Jesuit Pope will lead his flock. I know it will not be an easy task but in my opinion we are headed in the right direction. How many days was Pope John Paul I with us? Earnestly pray that Pope Francis will have many 100s and not be remembered as St. Francis,Martyr! We have prayed for a Pope like John XXIII. John Paul I lasted 30 days. Now pray again that Pope Francis will have many 100s of days: that we will not remember him in Liturgy as St. Francis, Martyr. It's also time to get out into the "intellectual street." It's remarkable how little dioceses are able to explain publicly the basis for Church teachings. I await this Pope's first pronouncement on the shortage of priests, which is already at the point of crisis. His two predecessors seemed oblivious of this. I am somewhat familiar with five parishes not far from my home. Four of them have one priest, none of whom are young. One has been without a priest for six months. I really don't care much about how the Pope dresses, or where he chooses to live, or whether he washes anyone's feet. He is the head of a Church with more than a billion people and needs to focus on its urgent problems. It is very disappointing that so far he has not even mentioned this one. @Thomas - In my opinion, it matters a great deal the example the Holy Father has set so far in his demeanor, his humble choice of dress and abode, his refusal to "hide" in an enclosed Popemobile, his sacramental outreach to those of different faiths (sorry, I think the foot-washing of Muslims and women in the prison is quite signifcant), his olive-branch to non-believers of good will, and his obvious love for the poor. But I do agree to a point. It's time to roll up the cassock sleeves and get to work. Action on the priest shortage, including addressing the valid proposals of married priests, women deacons, and welcoming of validly celibate homosexual priests. Action on the abuse scandal, including discipline of complicit bishops. Clean house with the Vatican Bank. Action on the poor and environment, beyond encyclicals and homilies. The Holy Father has proven quite quotable since his election. Now he must preach the Gospel to us with his actions as well. Pope Francis inspires me daily. He's the only pontiff I've ever called "Papa". I hold the bar of hope extremely high for this man who wouldn't bestow a blessing on the world until he received a blessing FROM the world. Come, Holy Spirit! The examples you mention regarding his demeanor, humble life style,and outreach are praiseworthy; I'm not arguing that. I am saying that they are less important than taking action on a horrific crisis that only he can alleviate. We are a sacerdotal Church. It cannot survive in any recognizable form if we don't have priests. At my first Eucharistic liturgy, I welcomed the faith family to offer their blessings first. As I knelt before the faith family, they approached one by one. It took about and hour and half and I sensed Christ was saying, "Welcome to my priesthood". Afterwards nobody was around to receive my blessing. They had been blessed by Christ in offering their blessings to me. What is amazing about this sacred moment is that no photograph history was recorded. It was wonderful hearing about Pope Francis' desire to be blessed by the People of God. I daily pray the Spirit of just relationships will be central in the Universal Family of God. A return to a decentralized Church open to the challenge of the Lord's Prayer: "Thy will be done on earth as it is in heaven". A wisdom and vision that respects a "Sacred Loving Equality" amongst the People of God. If Pope Francis is God's instrument, our Universal Family of God ought to awaken to a New Pentecost. Most especially, our extreme conservative sisters and brothers in God's Family. Our future will be either a museum tragedy or a space age continuance, as we respond to the hope of a New Pentecost. John Carr is the “Washington Front” columnist for America. He is also director of the new Initiative on Catholic Social Thought and Public Life at Georgetown University. He previously served as director of the U.S. Catholic Bishops’ department on justice and peace for more than two decades.